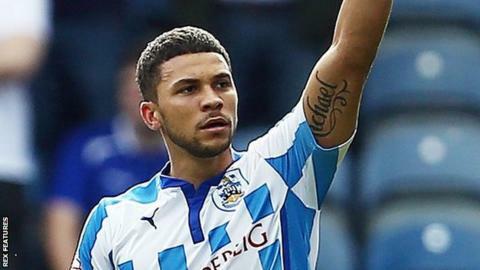 Striker Nahki Wells scored twice as Huddersfield Town comfortably beat Preston North End in the Championship. Late in the first half, Wells tapped in the game's opening goal when he latched onto a cross from Emyr Huws. Wells latched onto Harry Bunn's pass to double his tally, before Huws scored the home side's third goal directly from a corner. Preston scored a consolation goal late on when Adam Reach rounded keeper Jed Steer to place the ball home. The visitors had the first chance to break the deadlock when Joe Garner's long ball found Will Keane whose shot was gathered by Steer. Following Tom Clarke's cross into the Huddersfield box, North End winger Reach was on hand to nod goalbound but Steer saved again. Huddersfield were rewarded for a spell of pressure towards the end of the first half when Huws drove a ball into the path of Wells, who poked home from close range. Huddersfield's win against Preston North End is only the second time they have won in their past 10 Boxing Day games, with their previous festive three points coming against Chesterfield in 2011. Soon after the break, Huddersfield could have doubled their lead when Pickford spilled Bunn's low effort, but Wells' follow up was judged offside. The hosts went 2-0 up when Bunn teed up Wells who made no mistake from an acute angle, before Huws put them out of sight with a wind-assisted goal straight from a corner. Preston struggled to respond in a difficult second half but found a late consolation when Paul Gallagher crossed for Johnson to coolly fire past Steer. Huddersfield head coach David Wagner: "The result was good, but not the performance in the first half. I'm not sure what the reason was. "The conditions were difficult, especially with the wind against you, as it was for us in the first half. "The result was good and we scored good goals. The table doesn't matter as much as the performances and the results and we need to be more consistent." Preston manager Simon Grayson: "None of my players did what I wanted them to do. "It was disappointing. We made three good chances and if we had scored in the first 12 seconds the result would have been different. "We were too loose in possession and if you do that in the Championship you get punished. It's a lesson for us to learn." Match ends, Huddersfield Town 3, Preston North End 1. Second Half ends, Huddersfield Town 3, Preston North End 1. Goal! Huddersfield Town 3, Preston North End 1. Adam Reach (Preston North End) left footed shot from the left side of the six yard box to the centre of the goal. Assisted by Paul Gallagher. Offside, Huddersfield Town. Tommy Smith tries a through ball, but Nahki Wells is caught offside. Daniel Johnson (Preston North End) wins a free kick in the defensive half. Attempt saved. Harry Bunn (Huddersfield Town) right footed shot from the centre of the box is saved in the centre of the goal. Assisted by Joe Lolley. Attempt blocked. Daniel Johnson (Preston North End) left footed shot from outside the box is blocked. Assisted by Josh Brownhill. Substitution, Huddersfield Town. Jamie Paterson replaces Jonathan Hogg. Offside, Preston North End. Adam Reach tries a through ball, but Will Keane is caught offside. Attempt blocked. Joe Lolley (Huddersfield Town) left footed shot from outside the box is blocked. Assisted by Harry Bunn. Attempt saved. Nahki Wells (Huddersfield Town) left footed shot from a difficult angle on the left is saved in the centre of the goal. Assisted by Harry Bunn. Substitution, Huddersfield Town. Martin Cranie replaces Emyr Huws. Attempt missed. Sean Scannell (Huddersfield Town) right footed shot from the centre of the box is too high. Corner, Huddersfield Town. Conceded by Paul Huntington. Attempt blocked. Harry Bunn (Huddersfield Town) right footed shot from outside the box is blocked. Assisted by Joe Lolley. Attempt saved. Harry Bunn (Huddersfield Town) right footed shot from outside the box is saved in the centre of the goal. Assisted by Nahki Wells. Goal! Huddersfield Town 3, Preston North End 0. Emyr Huws (Huddersfield Town) left footed shot from a difficult angle and long range on the right to the centre of the goal following a corner. Attempt missed. Nahki Wells (Huddersfield Town) left footed shot from the left side of the box is close, but misses to the left. Attempt saved. Nahki Wells (Huddersfield Town) left footed shot from the left side of the box is saved in the centre of the goal. Attempt missed. Sean Scannell (Huddersfield Town) left footed shot from outside the box is high and wide to the left. Foul by Joe Lolley (Huddersfield Town). Calum Woods (Preston North End) wins a free kick in the defensive half. Delay in match Joe Garner (Preston North End) because of an injury. Substitution, Preston North End. Calum Woods replaces Marnick Vermijl. Corner, Preston North End. Conceded by Ben Chilwell. Joe Garner (Preston North End) is shown the yellow card. Joel Lynch (Huddersfield Town) is shown the yellow card. Substitution, Preston North End. Josh Brownhill replaces Neil Kilkenny.